Lasting love: Marge and Bill Hilleard are celebrating 70 years of married life. AS Australia moves on from the hype of another royal visit – that of Prince Harry and Meghan Markle – a Queensland couple can share a laugh about the day their family pet stopped the prince’s dad in his tracks. Bill and Marge Hilleard, who for many years raised their family of five opposite the entrance to one of Brisbane’s major hospitals, remember the day Prince Charles drove past their front gate. He was on his way to an official ceremony where The Chermside Hospital (previously The Brisbane Chest Hospital) would be re-named “The Prince Charles Hospital”. “We lived in Rode Road, Chermside – right at the entrance to The Chest Hospital,” Marge said. Clare, one of Bill and Marge’s two daughters, said their dog Sugarfoot decided it wanted to cross the road just as Prince Charles’ car was passing by. “He had to slow down for our dog, didn’t he?” Clare said. “The prince was there, yes, and he had to wait for the dog to walk across,” Marge said. That was back in 1974 – not even halfway through Bill and Marge’s life together. As veterans of 70 years of marriage, they could well have been the perfect couple to offer the newlywed royals a word or two of advice on making a go of it but Bill and Marge are not ones for that sort of thing. Bill agreed, and they both had a laugh. “No, but neither of us hold onto things,” Marge said. “You know, we sort of say what we’ve got to say, get it out and it’s gone. Sixty-one people – all but three of them related – gathered at the Caloundra Powerboat Club recently to help the couple celebrate their platinum anniversary. Their story that has grown to include five children – Michael (William), Anne, Tony, Clare and Gregory – 14 grandchildren, 17 great-grandchildren and one great-great-grandchild due in January all started in Miles Street, Wooloowin, in Brisbane’s northern suburbs. They were neighbours – Marge’s family living at 38 Miles Street, Bill’s at 24 – but she didn’t notice him for quite a while. “I used to be very friendly with Bill’s sister (Margaret, now deceased), and we used to go out a lot together and that’s how I met him, through her,” Marge said. That all changed when Bill returned from army service in the Pacific during the Second World War. He enlisted when he was 18 and returned three years later. “They gave Bill a welcome-home party and that’s where I met him, at his place,” Marge said, remembering the start of their love story. They were married at their local parish church, Holy Cross, Wooloowin, on October 9, 1948. “I remember it as clearly as if it was yesterday,” Bill said. Bill, now 95, also has clear and fond memories of those early days, days when he was an athletic teenager relishing his first job at a sawmill in Albion, one suburb from Wooloowin. “When I worked at the sawmill, I would leave home when the five-to-eight whistle blew, and I reached work at eight o’clock, which was a good, brisk run of a morning, every morning during my working life at Campbell’s,” he said. It wasn’t long before he landed a job with Shell Oil Company, and that was the one that was to shape his life. “They formed Shell Chemical, for agricultural chemicals, and I stayed with them for the rest of my career, and ultimately I held the position of deputy Queensland manager for Shell Chemical,” Bill said. He remained with Shell until he retired at 55. “That was the standard retirement age for Shell. Everybody had to retire at 55 – (according to) the UK statutes,” he said. Outside of work and busy times with their five children Marge and Bill were actively involved in Church life, including with the Catholic Family Movement. “It was for the young married people … We sort of used to get together and we’d air our problems and help one another out,” Marge said. Bill was also active with the St Vincent de Paul Society for more than 30 years. Marge wasn’t a member – “I was busy rearing the children” – but she and Clare remember helping Vinnies during Brisbane floods in the 1970s. “You went over and cleaned houses and brought washing home,” Clare said. Faith’s all-important to the Hilleards. Bill and Marge moved from Chermside to an idyllic life at Caloundra’s Golden Beach in 1978. Bill and Marge also caught the travel bug. “Our travels overseas took in all sorts of places including up to the Russian border … around the Pacific … England, France, Italy, Finland … all around Europe,” Bill said. It was one of the simpler pleasures closer to home that stood out for Marge. “One thing I remember from our retirement is going down and seeing the tulip fields down in NSW,” she said. And, of course, family means everything. 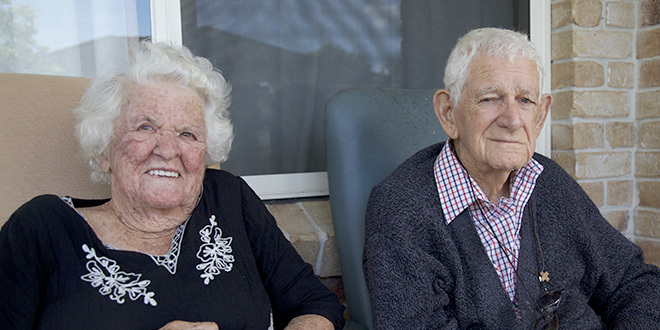 As age was catching up, Marge and Bill moved to Caloundra Rise Retirement Village, run by Southern Cross Care of the Knights of the Southern Cross, 15 years ago, and in April this year Bill moved into care within the village. With the help of Clare, he is happy to be able to visit his 93-year-old wife in their unit daily. “We’ve been lucky, thank God,” Marge said. “We have had a great life. The Lord’s been good to us. “We haven’t been rich, have we? But we’ve had enough to get by. “I think we’ve done the best we could do with what we’ve had to offer,” Bill said.